On January 27th, 2015, at exactly 11:37pm, we welcomed this little angel into our family. He is such a sweet little soul, and I have fallen deeply and profoundly in love with him. It was an incredibly fast and tumultuous delivery, totalling at a mere 4 hours from start to finish! But we are all doing well and settling in nicely as a family of FOUR! Throughout the pregnancy, Noah had remained in breech position despite my best efforts at turning him with yoga exercises, visualization, and strong words of encouragement. I finally decided to try an external cephalic version at 36.5 weeks, and thankfully it worked. So with Noah finally in the head-down position, I started to mentally prepare myself for the upcoming vaginal delivery (up until this point, it had been looking like a planned cesarean section). On the night before Noah's birth I woke up at 3am and couldn't sleep again until 5am. I felt restless and my mind kept ruminating about all the things I had left to do before the baby arrived. I was having very mild, non-painful contractions, but nothing patterned or significant. I didn't think anything of it. But the next morning I lost my mucus plug. Well that's interesting, I thought, but again didn't make too much out of it. It did, however, kick Adrien & I into baby-preparation mode, just in case. We did laundry and washed the crib sheets, finished packing the hospital bag, and stocked the fridge with groceries, and the freezer with healthy pre-made meals from a little Italian deli near our house. At around 5:30pm, as I was standing at the stove cooking supper, I had a mild-ish contraction and then felt a small gush of warm fluid down below. I didn't say anything and just kind of hobbled to the bathroom thinking I may have just embarrassingly peed myself! But then the fluid kept coming and I realized my membranes had in fact ruptured. I texted Adrien, who was at the gym, "my water just broke!" And he rushed back home. My contractions only started around 7:30pm, about 4 minutes apart, very mild at first, and then slowly increasing in intensity. Thankfully my father had been over visiting for supper, and he agreed to spend the night and take care of Zac. We put Zac to bed at his usual bedtime of 8pm. I had to pause a few times to breathe through a heavy contraction while I read him bedtime stories. Adrien explained that Mamma was going to have the baby very soon and that we might even get to meet him tomorrow. At around 9:30pm Adrien checked my cervix and said it was 2.5cm dilated. So still a long way to go. We contemplated staying at home for a few more hours but our intuitions told us that maybe we should go to the hospital early since it was a second labour and a smaller baby... it had the potential to go very quickly. During the drive to the hospital things started to get intense! Damn Montreal pot-holes and bumpy winter roads.... it was brutal! It was crazy cold out, like minus 25 degrees, and my entire body was shaking vigorously as we walked from the car to the hospital. At every contraction I had to stop and lean against a car or lamp post, while Adrien would push against my back to help relieve the pain. And we would breathe in and out together until it subsided. He was such a great labor partner, that husband of mine. We finally made it to the labor & delivery floor, and the nurse checked my cervix again (only 3cm). I was hooked up to a fetal monitor. That part was brutal - having to sit in that stupid chair in triage hooked up to the electronic fetal monitor for 15 minutes... all I wanted to do was move! They finally got me into a delivery room and tried again to hook me up to the fetal monitor, but they were having a lot of trouble getting a consistent reading of the baby's heart rate. The machine kept picking up my heart beat instead... but they weren't 100% sure... was it really my heartbeat or the baby's heart decelerating? The obstetrics resident said they would have to insert an internal monitor (a clip onto the baby's head). Oh no, I thought, not even an hour after being in the hospital and we are already running into complications and interventions. I'm headed for a c-section for sure! Meanwhile, my contractions had become unbearable! I was writhing & moaning in the bed, trying my best to remain still as they tried various monitors in attempts to track the baby's heart beat. I remember feeling really nauseous at this point. And then I had the mother of all contractions! I must have looked really awful because someone asked me if I wanted an epidural at that point. I said "no, but if the contractions continue like that last one, I think I might have to". "so you might want that epidural eh? 'Cause you're fully dilated and you're about to have your baby. Like now". Suddenly there was a blur of activity buzzing around me. Nurses opening equipment trays, the resident getting suited up, the poor medical student fumbling to finish her admission note (still asking out loud "any allergies? any medications? Any past medical problems?"). I was in another world at this point, just me, the baby, and those all-powerful, all-consuming contractions. I remember asking, "So can I push then??!". And the resident said, "we're not quite ready, but if it feels good to push then go for it". I gave one incredible push and I screamed at the top of my lungs (I never thought I'd be a screamer!). I could literally feel the baby's head descend through the birth canal, spreading my pelvic bones apart. It was surreal. And the most intense feeling I have ever experienced in my entire life. I could hear Adrien saying, "Vanessa, the head is right there, it's incredible, he's almost out, you're doing amazing!" Two more pushes and out he came! And there he was! This tiny creature. A mere 6.0 pounds (my first was 8 pounds 2 ounces!). No kidding he came so quickly! It was all so sudden. So tumultuous. So wonderfully and unexpectedly to the point. Everyone around me was laughing in shock about how fast it had gone. They hadn't even had time to install an I.V. in me. My doctor didn't make it to the hospital on time (she arrived 15 minutes later). They handed him to me right away. He was so serene, so quiet and peaceful, and wide-eyed. While I, on the other hand, was still kind of in shock by the whole process. The only thing I could say was "I. Need. Water!" And then I breastfeed him right away - he was so hungry! And as I nursed him, we stared into each others eyes. And folks, let me tell you, that is how mamma-baby bonds are formed, because I could feel myself falling deeper and deeper in love with this little being by the second. I finally got my "epidural-free birth" that I had so wanted with my first labour. With no tears and no stitches, thanks to his small size. What an incredible experience! (You see, I come from a long line of powerful hippie-minded women who all gave birth at home with midwives back when that was technically still illegal! So on some level, I guess I had something I needed to prove to myself... as ridiculous as that sounds). But yes, our Noah is rather tiny for being born at 38+2 weeks. 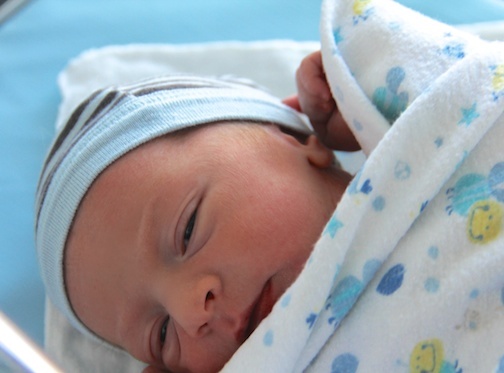 His birth weight of 2.76 kg brought him just below the 10th percentile. Throughout the pregnancy I had suspected that something might be wrong, because I struggled to gain weight (believe it or not) and my uterus was always measuring too small. Turns out, my placenta was split in two, with a completely detached accessory lobe, as well as having a marginal insertion (excuse the medical lingo). Basically, little Noah wasn't getting optimal nutrition for optimal growth... which probably explains why he decided to come early. He needed more nourishment, which my body could only give him on the outside. But he's here now and he's healthy. And he's feeding and growing beautifully. We are so blessed to have him in our lives! Welcome to the world, little Noah! Aw, he is precious! Congratulations! In other news, I managed to get all the way to your first push before crying uncontrollably. Thanks Natalie! We can't wait to see you again and get Lola & Noah together... They are going to be best buds! Oh Vanessa, that post brought me to tears!!!! Should you ever decide that being a doctor isn't for you, an author should be your next adventure! I was so thrilled to read this post from you. I have been finding myself checking your blog and then reminding myself that you just had a baby and writing his birth story isn't your top priority! Thank you so much for sharing it. I am so happy for you. I knew you could be as brave and strong as those warrior women in your life. You are certainly among them now! Sending you lots of love. He is so beautiful, just like his momma. This is incredible. I read the whole story twice. How awesome! Congratulations to both of you. I am getting so antsy for my birth story to commence! What an absolutely beautiful Mother and Baby! Thank you for your wonderful birth story. Vanessa, what a beautiful, empowering story. Congratulations to you and your family of four! Welcome, little Noah. I must admit that your birth story reminded me so much of my own. Our daughter was born just four hours after my water broke (or rather trickled). I was also surprised that she weighed 5 lbs, 2 ounces, but she was healthy and ready for the world. Within six weeks, her weight doubled, and I'm sure Noah will do just beautifully with such a loving, caring family. That's really impressive (and encouraging) to hear about your daughter's rapid weight gain... I have a feeling little Noah is heading in that direction too since many of his newborn clothes are already too small for him.